A computer-controlled hybrid flying machine that lifts off vertically like a helicopter, leans to a 90-degree angle and flies horizontally like an airplane – developed at Embry-Riddle Aeronautical University – has garnered international research support. 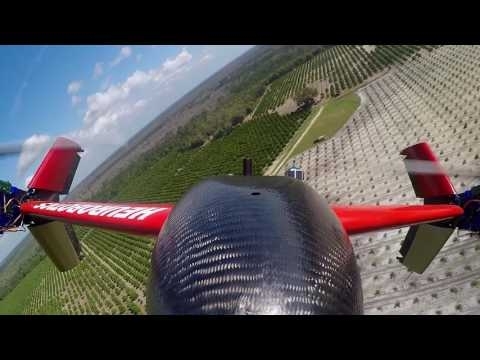 The Mark II aircraft, designed by researchers at Embry-Riddle’s Eagle Flight Research Center (EFRC) and a related business spinoff called Heurobotics, promises precision farming as well as improved search and rescue, infrastructure inspection and more. The project was among the fourth-round winners of industrial research and development funding provided by Space Florida, the aerospace and spaceport development authority for the State of Florida, and the Israel Innovation Authority, an organization committed to maintaining Israel’s position at the forefront of global innovation. The Space Florida-Israel Innovation Partnership Program, established in October 2013, is a $2 million recurring joint fund supporting research, development and commercialization of aerospace and technology projects that benefit both Israel and Florida. Embry-Riddle and Heurobotics teamed up with Israel’s Agrowing company to become one of five winners of the latest Space Florida-Israel Innovation Partnership grants. The Mark II vehicle, which moved from design to production in February this year, could prove useful for precision agriculture as well as search and rescue missions, remote detection of flaws in bridges or buildings, security and surveillance, and other uses. For example, the Mark II was recently used to determine the minimum height of antennas used for infrastructure data transmission. The Mark II vehicle has been flying successfully since 2016, when it first demonstrated the ability to take off vertically, transition to forward horizontal flight, perform turns in forward flight, and transition back to hovering flight before landing vertically, said Zachary Kern, Heurobotics’ chief operating officer. The aircraft is currently battery-powered, but Anderson envisions a gas-powered version as the research team works to optimize its debut design. While the prototype weighs slightly less than 40 pounds, Anderson said it should be possible to trim the design by half. The concept “wasn’t supposed to work,” Anderson added. “The Mark II airframe is so simple that you could build it in your garage in a couple of weeks, but without our control algorithms, it would be completely unstable on all axes within milliseconds as soon as you tried to fly it.” Existing vertical-to-horizontal vehicles, such as the MV-22 Osprey, tend to involve complex mechanical systems such as tilting rotors, Anderson noted. For precision agriculture, farmers need a machine that can rapidly cover many acres of land, zero in on a single diseased tree or other plant, and treat it. The Mark II can scan up to 250 acres and fly for 20 minutes on a single battery charge, and recharging takes only 45 minutes. The technology should help minimize the use of pesticides and herbicides and improve crop yields as well as profitability, Anderson said.